↑ Van Driem, George "Tibeto-Burman Phylogeny and Prehistory: Languages, Material Culture and Genes". ↑ Petech, Luciano (1988). 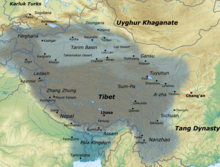 "The Succession to the Tibetan Throne in 704-5." Orientalia Iosephi Tucci Memoriae Dicata, Serie Orientale Roma 41.3. pp. 1080-1087. ↑ Grunfeld, A. Tom, The Making of Modern Tibet, 1996, p37-38. Hoffman, 393. Shakabpa, 54-55. ↑ Walt van Praag, Michael C. van. The Status of Tibet: History, Rights and Prospects in International Law, Boulder, 1987, p. 37. หน้านี้แก้ไขล่าสุดเมื่อวันที่ 1 มีนาคม 2562 เวลา 22:02 น.